A nonsmoker who regularly works out, Dan Friedman wasn’t the stereotypical person at risk for lung cancer. Yet there he was in 2011, at age 43, hearing he had the disease. Friedman’s story is more typical than many people think. Factors, including a family history of the disease and exposure to secondhand smoke or asbestos, are also threats. Broadening people’s understanding of lung cancer is an important goal of the Chris Draft Family Foundation. As part of a national campaign to change the face of the disease, the Draft foundation invited lung cancer patients and physicians to NFL games across the country on Nov. 18. 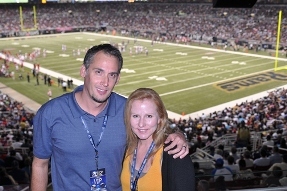 Friedman attended a St. Louis Rams game with his wife, Kelly Corday, and their children Mary, 16, and Jon, 14. (Another son, Daniel, 21, is in the U.S. Air Force, serving in Japan.) Siteman medical oncologist Maria Baggstrom, MD, met Friedman’s family at the game. Chris Draft, the former Rams linebacker who founded the nonprofit, lost his wife, Keasha, to lung cancer last year. She also was a nonsmoker. The foundation’s “Survivor at Every Game” campaign is meant to educate people about the misconception that lung cancer is only a smoker’s disease and encourage more funding for lung cancer research. Friedman, who was diagnosed with stage IV non-small cell lung cancer in May 2011, has found hope through prayer and his treatment at Siteman. A gene study showed he had the EGFR mutation. Fortunately, a drug called Tarceva had been approved as a first-line treatment for lung cancer patients with the mutation. This meant Friedman’s treatment would be simpler than traditional chemotherapy and most likely more effective because the drug targets a mutation within cancer cells more accurately. 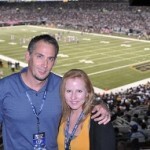 This entry was posted on Wednesday, November 21st, 2012 at 10:53 am	and is filed under A Survivor at Every Sports Venue. You can follow any responses to this entry through the RSS 2.0 feed. You can leave a response, or trackback from your own site. If some one desires expert view on the topic of running a blog afterward i propose him/her to pay a visit this webpage, Keep up the fastidious work.